My sister, sister-in-law and I went to the Faith & Writing Festival at Calvin College. I've been to several and they're always great. This year I happened to hear several poets read or talk about poetry and one was Aaron Belz. 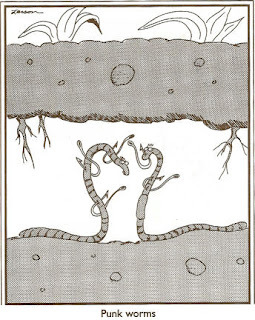 When he read his poem "Worms" (below), I thought his poetry was like "The Far Side" cartoon -- but in poetic form. He kind of takes words or phrases or sayings and flips them every which way. Some of his poems are super short. When he read those, there'd be a silence as people waited: Was there more? Oh, he's done, okay, clap. He would read them very straight-faced, kind of deadpan, and hardly ever react. Just a tiny smile once in a while. I ordered the book Lovely, Raspberry and am enjoying reading more of them. I just realized that maybe this blog entry should've gone in my other blog, "Mavis Reads, And Writes to Tell About It." But I was thinking about the poetry, not the book so much, so I'll leave it here. Enjoy. That's not very good either. think cyclists are cheating; they use wheels. about people in wheelchairs; they use wheels. are cheating. Their disdain is uniform. however, in their use of automobiles. Everyone uses automobiles except worms. Worms think they're better than everyone. Worms think they're more authentic than everyone. 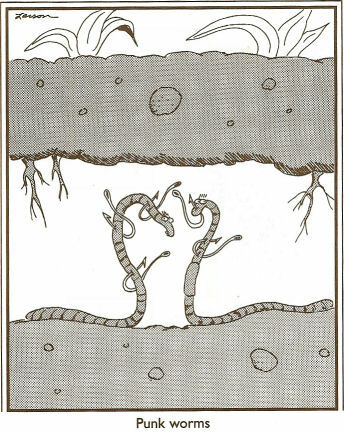 This is why people say worms are self-righteous. Those worms are called millipedes. Those worms are really bad apples.